The passing of the Foreshore and Seabed Act 2004 under the Labour-led government led to the resignation of Tariana Turia from the Labour Party and the formation of the Māori Party. In 2009 the National-led government undertook a review of the act, as stipulated in a confidence-and-supply agreement with the Māori Party. The result was the Marine and Coastal Area (Takutai Moana) Act 2011. 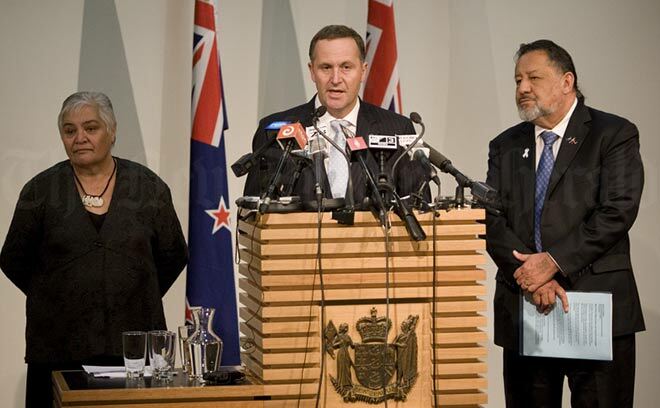 This is Prime Minister John Key (centre) and Māori Party co-leaders Tariana Turia and Pita Sharples in 2010, announcing that the 2004 act would be scrapped.